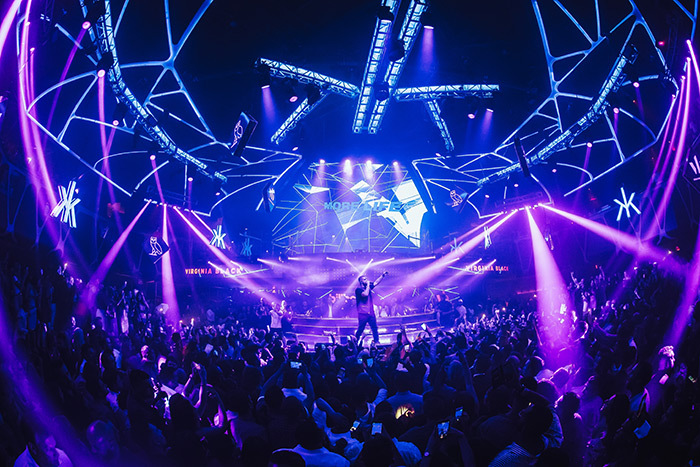 Last Sunday, (May 21) Hakkasan Las Vegas Nightclub inside MGM Grand Hotel & Casino hosted the Official After-Party for the 2017 Billboard Music Awards with a live performance by Drake. After bringing home a record-breaking 13 awards including Artist of the Year, the rapper arrived at the prestigious nightlife destination around 1:20 a.m. and was joined by friends and family, including Kevin Hart, the evening’s award show host Vanessa Hudgens, PartyNextDoor and Drake’s father, Dennis Graham. Looking handsome in dark jeans, a black t-shirt and black vest, the GRAMMY-Award winner and his group were seated at a VIP booth located on the Main Stage behind the DJ Booth. As the internationally renowned musician settled into his table, the Main Club soared as thousands of fans chanted his name before taking the stage around 1:45 a.m. The entire nightspot erupted with excitement as the lights dimmed and the “Views” artist appeared center stage. Thanking his fans for being there with him on such a memorable night, the rapper began performing a number of his chart-topping hits as the packed room danced and sang along. Commanding the stage and interacting with the crowd, Drake put on a memorable performance with songs including “One Dance,” “Fake Love,” “Passionfruit” and much more. During his performance, Hart surprised the artist and the crowd a he jumped on the mic and praised Drake for his 13 award wins and all of his accomplishments.Drake also stopped mid-show to offer his fans some appreciation and well wishes. He made a toast to the crowd as he sipped Virginia Black whiskey and shared shots with the crowd. 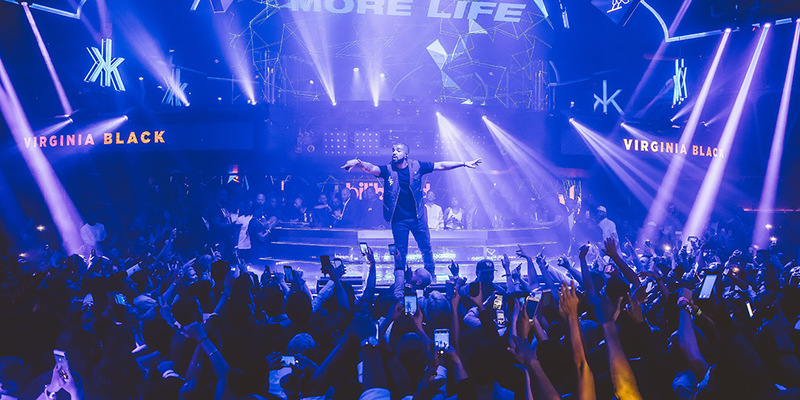 As Drake brought his performance to an end, the talented star thanked all his fans, proclaiming that he had the greatest night ever, and made his way back to his VIP table. 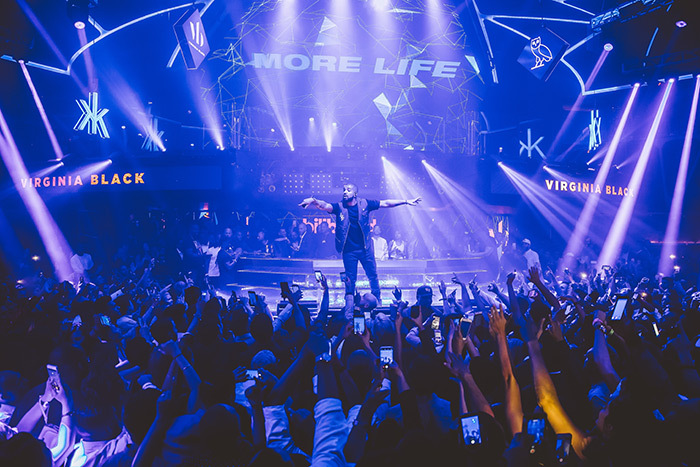 Drake’s presence brought the energy in the nightclub to an unrivaled level throughout the night as guests danced and partied into the early hours of the morning. Earlier in the evening, Drake decided to kick off the after-party festivities with a late dinner at Hakkasan Las Vegas Restaurant with a number of his guests, including Kevin Hart, Vanessa Hudgens, and PartyNextDoor. Drake and his group of friends enjoyed several of Hakkasan’s signature dishes including Hakka noodles, Black pepper beef and Vegetarian chicken in black pepper sauce while enjoying a few of Hakkasan’s signature cocktails, including The Hakka. Also spotted dining at the famed restaurant destination was Miss America, Savvy Shields.